The Milwaukee Bucks are celebrating their return to the NBA Playoffs by hosting a Cheer the Deer Lunch Playoff Party on Wednesday, April 24. Bucks fans will be treated lunch for just a buck (get it?) from 11:30 a.m. until 1 p.m. In addition to $1 lunch, fans will also enjoy entertainment from the Hoop Troop, the Energee! Dance Team, and Bango. Bucks fans will also have the opportunity to pick up Bucks playoff swag. The Cheer the Deer Lunch Playoff Party will take place at the BMO Harris Bradley Center in the East Atrium. Check out Bucks.com for a full listing of Playoff Week events. If you’d like to see the Bucks play the Heat in the NBA Playoffs, tickets are available on the Ticketmaster website. 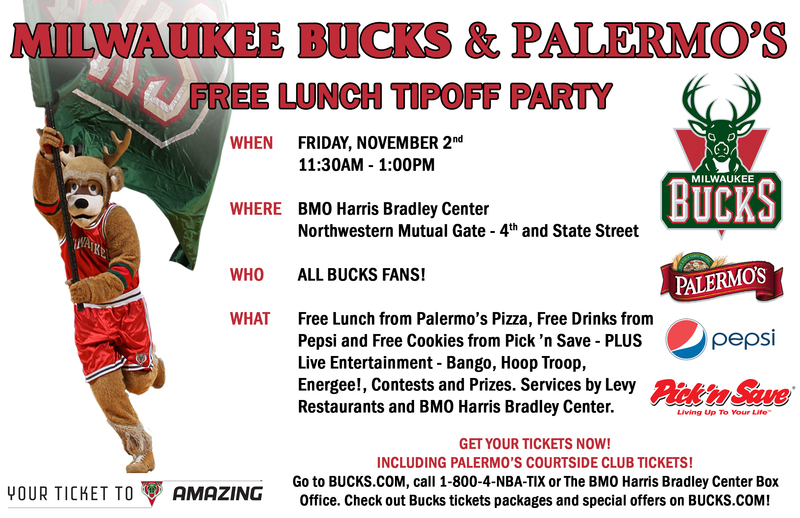 The Milwaukee Bucks are hosting a Free Lunch Tipoff Party on Friday, November 2 to celebrate the start of the 2012-13 NBA season. Live entertainment from Bango, Hoop Troop, and Energee! The Free Lunch Tipoff Party will take place at the BMO Harris Bradley Center at the Northwestern Mutual Gate (4th and State Streets). The official announcement can be found on this flyer from the Milwaukee Bucks.